London, the capital of England and centre of government for Great Britain and the British Empire, is in fact not one but two cities, within a greater conurbation. The first is the historic City of London which has its origins in pre-Roman times. It contains St. Paul’s Cathedral, the Bank of England, Lloyds of London, is home to the ancient Companies and Guilds, has its own police force and local laws administered from the historic Guildhall by the City of London Corporation under the Lord Mayor. The second is the City of Westminster, elevated on creation of the Diocese of London in 1540 under the Cathedral Church of St Peter, better known as Westminster Abbey. It contains the Palace of Westminster, home of the Houses of Parliament, and many important buildings and functionaries. Whilst the Diocese only existed for ten years, the title City was retained by custom and formalised by Royal Charter in 1900. If the City of London is the commercial capital then the City of Westminster is its civic and cultural equivalent, containing government departments, embassies, theatres and galleries, hotels, gentlemen’s clubs, and purveyors of fine items to the gentry. The large conurbation that surrounds both, often referred to as the Metropolis, has its own local government and the largest police force within the United Kingdom. The London County Council, formed in 1889, has by 1900 expanded to comprise 28 Metropolitan Boroughs (including the City of Westminster) and with its own Mayor. Surrounding the County of London are the Counties of Middlesex and Essex to the north of the River Thames, and Kent and Surrey to the south (a small enclave of the County of Kent exists on the north bank of the River Thames opposite Woolwich). The City of London comprises 26 electoral Wards. Basilica Without is the north east corner and adjoins the Wards of Bishopsgate and Portsoken, while to its east is the City’s boundary with that area which, in 1900, became the Metropolitan Borough of Bethnal Green under the London County Council. The suffix ‘Without’ defines it, along with parts of some other Wards, as being situated outside the London Wall. 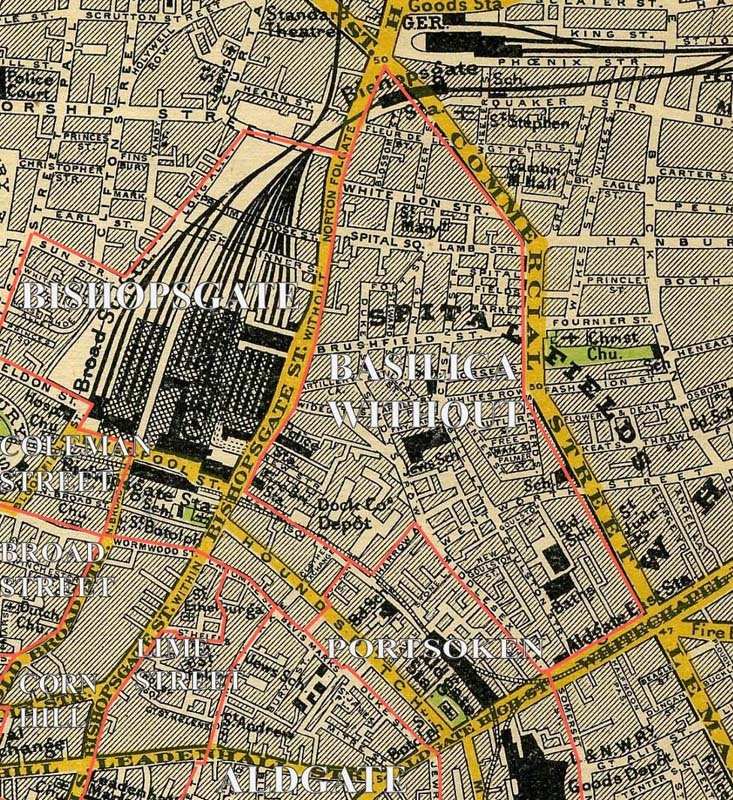 The boundary of the Ward of Basilica Without runs slightly west of south down the centre of Norton Folgate which becomes Bishopsgate, with Liverpool Street station immediately to the west, then bears south-east along the centre of Devonshire Road, north-east along Harrow Alley, and south-east down Middlesex Street. The boundary again turns north-east along the centre of Whitechapel High Street for a short distance and finally heads north-west to return along the centre of Commercial Street until reaching the junction between Norton Folgate, Great Eastern Street and Shoreditch High Street, just below the western end of Bishopsgate Goods Depot, formerly the Shoreditch terminus of the Eastern Counties and latterly Great Eastern Railways. The basis of the first settlement on the River Thames in this vicinity is the subject of much conjecture and dispute. It is considered more likely that any such was on the south bank of an expanse of water varying in size and depth according to weather and seasons. Evidence of early settlement on its southern margins exists in the remains of a pier or jetty near Vauxhall and dated to c1000 BC. Similarly there are conflicting theories as to the origin of the name. One particular suggestion is that the Brythonic (early Briton or Celtic) name was formed from Llyn or Llin (lake) and Din (town or harbour), and since the Romans tended to latinise local names then the linguistic variation giving Londinium seems entirely plausible. The Trinovantes were the most powerful tribe in pre-Roman Britain, occupying areas now within Essex and south Suffolk, capital at Colchester. West was the Catuvellauni (south Cambridgeshire, Home Counties and west to Oxfordshire), capital closer to London at St. Albans and the common tribal boundary much disputed and rather fluid. To the north was the Iceni (north Suffolk, Norfolk and the Fens), capital at Caistor St Edmunds just south of Norwich, while south of the River Thames was the Cantiaci or Cantii (Kent), capital at Canterbury and the Regnesnes, Regni or Regini (Surrey and Sussex), capital at Chichester. It is clearly no co-incidence that the capitals of each of these tribes became a Roman centre, and is often still the county town today. Thus the probable explanation that, as the Roman invasion of 43 AD led by Claudius headed for Colchester to establish a new capital there, London was founded by private venture, its location being ideal for trade in all directions. If such is true then the prescience of its founders is borne out by the City’s world-leading role today. Given its ideal situation, the settlement expanded rapidly on the north bank of the River Thames close to but downstream of the river crossing; remains of a massive bridge pier exist close to the present location of London Bridge. Its population grew with merchants from all parts of the Roman Empire aspiring to set up in business. In 60 AD Boudicca, Queen of the Iceni, led a revolt against the Romans by attacking Colchester, driving them out and repelling an attempt by a Legion sent from Lincoln to regain the town. In 61 AD she moved against London. The Roman governor Suetonius concluded an offensive in Anglesey faced with the dilemma to defend with a numerically inferior force or tactically withdraw and evacuate. He chose the latter, so Boudicca slaughtered those who had not escaped and burned the settlement. A new Roman army was gathered and the place of battle carefully selected. Boudicca and her supporting armies were defeated and slaughtered and Roman superiority, in southern Britain at least, was reassured. The Emperor Nero considered Suetonious to be too aggressive and likely to provoke further dissent, so replaced him by Petronius. One significant consequence was that London replaced Colchester as the Roman capital and reconstruction took place on more planned and traditional forms. were erected; shortly after a major fire (the first of many) burned down most of the buildings. The following reconstruction resulted in the civic administrative centre being based around the massive 2nd Century forum-basilica situated where Leadenhall Market now stands. The Roman capital grew larger and more prosperous until the Antonine plague (smallpox?) struck after 165 AD. As the population was reduced so was the level of trade, as Emperor Hadrian decided to cease all further expansion of the Roman Empire. 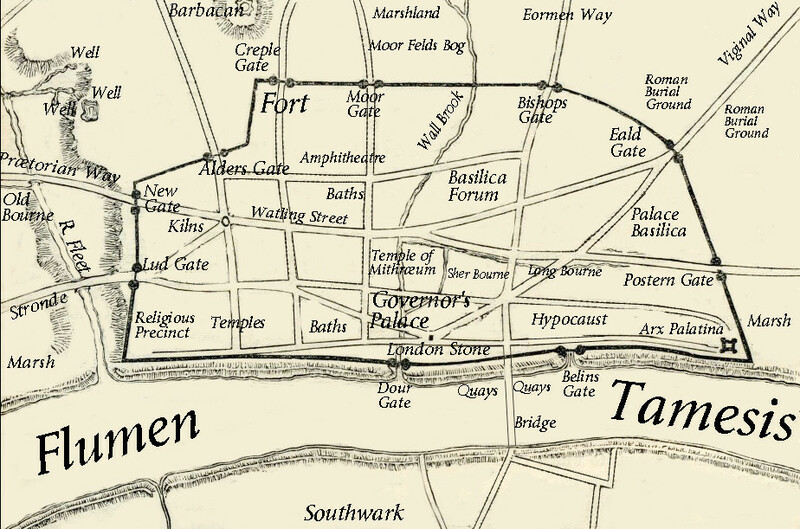 A defensive structure, the London Wall, was built around the city and to this day a number of Ward and locality names refer to its various gates and its former route still generally delineates the boundary of the City of London. The additional defence offered by the wall resulted in increased public activity and building construction in the first half of the 3rd Century. As the pattern and structure of Roman society changed, so the ruling elite preferred to be seen less frequently in public forums, and thus the original forum eventually gave way to a new and opulent palace, a forum-made-private where clients and supplicants were met each morning. “In tribute, a gift donated by Marcus Martiannius Pulcher, most honourable of men, pro-praetorian legate of the emperors, who restored this temple to Isis, which had collapsed through old age and lay in ruins”. This period of renewal made London more attractive to incursion; several attacks by Saxon raiders resulted in a defensive wall being constructed by the riverside and it is clear that even recently reconstructed buildings were sacrificed to provide materials. Gentlemen, there is a dimensional inaccuracy in the italicised text of the ‘Origins’ section. Until proven otherwise from work that has yet to be done (ref. Aristotle and the “Once and Future King”) the railway navvies of the most Worshipful Company of Contractors were affiliated to the alter of Scal-SvenOG rather than to the house of GOG or the more narrow minded abode of O-FS-OG. I bet Scal-SvenOG had a woden train set. Do I detect a spelling mistake or two? I am not sure which is correct in Adrian’s reply… could Scal-SvenOG have had a wooden train set and hence maybe royalties are due from Brio? or did our God of East End Railways have a figurine of Woden known to the Romans of Londinium as “Odin” – to be immortalised some centuries later by the naming of a Brush Type 4? Clearly, history is not beyond change. Sven the Dane a.k.a Svein Forkbeard – was the Viking who defeated Æthelræd II The Unræd in 1013. But that’s covered in the next bit. I regret that Ungrammaticus Grampus the Ursine is confusing his civilisations and millenia. The gaugium nominus of the ruts in Roman roads was determined by Avigottadealforu the Persian chariot maker. It remained unaltered for nearly 2 millenia, when near simultaneous events in Britain and France took place. A certain pint-sized Corsican ensured that his Imperial dominions would adopt the Metric system, to spite the British who had already got the true Imperial system, and despite the fact that his scientists got the distance around the equator incorrect, due to too long soujourns a manger and a surfeit of vin de cheval. The ancient roadways provided the model for plateways and eventually railways in the north-east of England. However, due to inadequate repairs, frequent rewheelings and wobbly axles, the carts used to determine the measure of gauge were not fit for the purpose and furthermore the rims had been widened to carry greater loads. The original ruts were thus insufficently wide to accommodate these coarse, wobbly wheels and had to be widened, but the measurement that became key to consistency was that between the centres of the ruts and not the inside edges of them. This practice of measuring centre-to-centre to locate the new-fangled railheads was continued for quite some time, and is the real reason for those peculiar short-changed gauges on Welsh quarry lines (e.g. 1′ 11″). With certain railways adopting other gauges, such as the Eastern Counties at 5′ 0″, and the Great Western instructed by IK Brunel to use his height as the measurement, but only when wearing his best re-heeled boots and finest (and tallest) stovepipe hat to determine it. As an aside, had IKB been a very portly man and had insisted on his girth being used instead, one could understand why ‘broad’ gauge, when it really should have been ‘ego compensating for lack of height’ gauge – but that would be too much to swallow. Later in the 19th C the gauge wars and deliberations thereon resulted in the adoption of a standard measurement between the head of the rails. Unfortunately no-one communicated this to German toymakers, who gaily carried on using the traditional centre-to-centre measurement enshrined in ancient Federal tinplate laws. Then Confundus Greenly arrived on the scene, mixed his metaphors, his measurements, and his metric and imperial and consequently left a legacy that still besets us to this day. It was at this time that the true believers, who were persecuted for their adherence to strict fidelity (and remain so to this day) were forced to communicate in hidden ways, heartened by the messages in code in the series of books about the Secret Seven by E. Blyton. The story put about by the Worshipful Company of Contractors is nothing more than a blatant attempt to impose a closed shop, demand higher prices for their services and charge a lot extra if you want it wider Guv.